How’s everyone out there doing today? I’m doing pretty good myself and I hope you’re doing good, as well. I have an optical illusion that I’m going to post today that definitely threw me off the first time I saw it. In other words, I definitely think that all of you are going to like this one. The great thing about some optical illusions is that they play tricks with your mind and will make you take a second glance, which is exactly what this image did to me, so don’t scroll down too fast. Instead, check out this image and you’ll see what I’m talking about. I have called this one the “Descending Rug Optical Illusion,” and you will definitely see why when you scroll down. 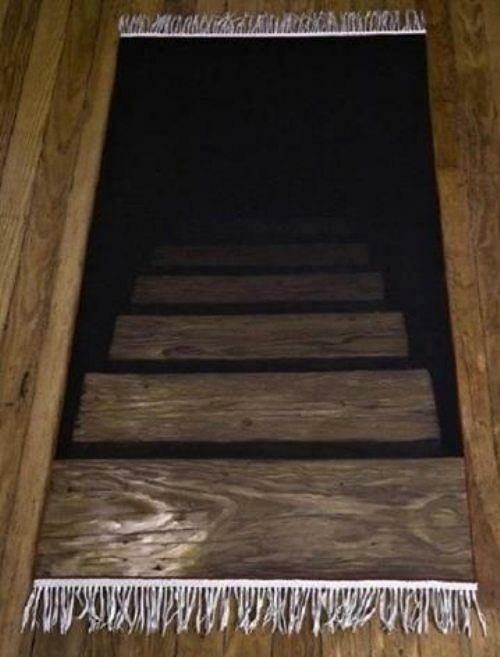 At first it just looks like there are some steps in the middle of the floor that are leading down to the basement, but as you can see, it’s just a rug. Now, I have to pick up some household supplies and decorations soon and I would love to have this thing in my house. I guarantee you it would throw a lot of my friends for a loop the first time they saw it. Would you put this rug in your house? If so, leave a comment and let me know. I can’t be the only one that wants this thing, lol. If you liked this post, you should use our star rating system below to rate this post, so I know you’re enjoying the material I’m posting up on the site. Lastly, you could also use the comments section to let me know what you think of this post. Very deceptive.It would be even better if it didn’t have the white trim at both ends…. I wonder if it would fool a dog or a cat. I agree, the white tassels ruin it. I think it’s great if they get rid of those tassels. Yeah, it needs to have like some wood planks at either end, not white strands. And yes, I would *so* put this on a wood floor in my house. Answered my own question. Available at cafepress.com they make to order so maybe they could put on brown or black fringe or just bind the edge.